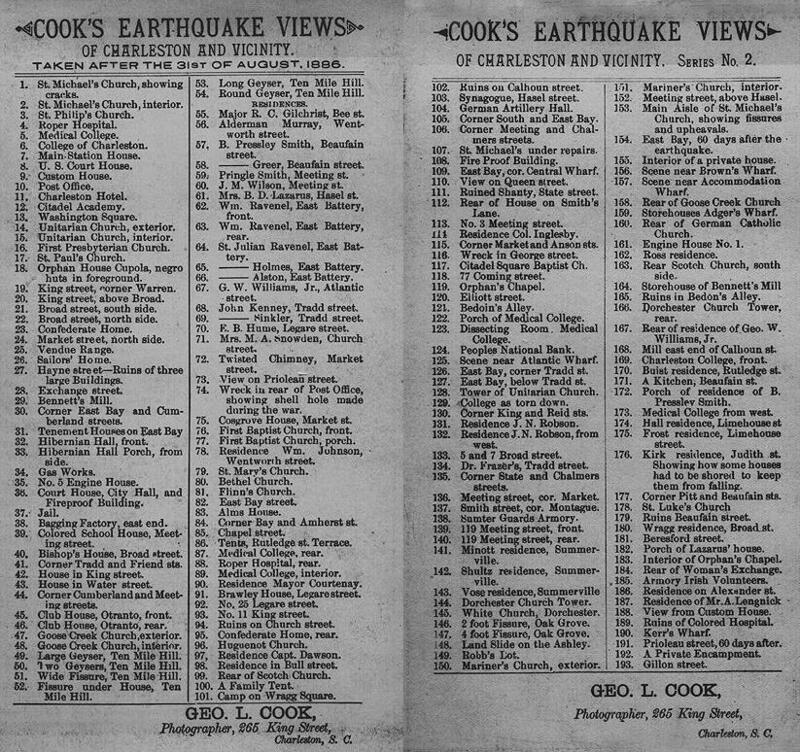 The following photos appear as a collection in the First-Hand Observations of the Charleston Earthquake of August 31, 1886 and Other Earthquake Materials, - South Carolina Geological Survey Bulletin 41 , compiled and edited by Kenneth E. Peters and Robert B. Herrmann. The bulletin includes collections of reports, correspondence, photographs and other data written or assembled by several investigators, some of whose works are represented here. Most of the items in Bulletin 41 were found in a warehouse on the campus of Saint Louis University. They were part of a collection of materials by W. J. McGee, one of the first employees of the U.S. Geological Survey. Many of his first-hand observations were rewritten for the 1887-1888 USGS Report by Dutton. These may have been acquired by the late Rev. James B. Macelwane, founder of the Geophysics Department here at Saint Louis University. The Saint Louis University Library archives contain a collection of correspondence and other reports by W. J. McGee. After inclusion in the S.C.G.S. Bulletin 41, the W. J. McGee field notes on the the 1886 earthquake were deposited with the University of South Carolina. This web page attempts to recreate the organization of Bulletin 41. Figure references and their captions were extracted from the bulletin. Represented here are collections of W. J. McGee, who worked for the U.S. Geological Survey and compiled one of the most extensive collections of earthquake data; materials from Earle Sloan, who reported extensively on the earthquake's effects on the epicentral area; and materials collected by Gabriel E. Manigault, the curator of the College of Charleston's Museum, which focussed on the effects of the great earthquake on Charleston's buildings and its inhabitants. We are grateful to the University of South Carolina's South Caroliniana Library for permitting the reproduction, here, of original materials which were included in the McGee, Sloan and Manigault collections and subsequently, in the S.C.G.S Bulletin 41. Fig. 63.2. "Track out of line"
Fig. 64.7.5, 65.7. "Azimuth of fissure, N30W"
Fig. 68 H 1. Medical college of South Carolina. Fig. 69 H 2. Broad St., south side, looking east. Fig. 70 H 3. Main police station, corner Broad and Meeting Sts. Fig. 71 H 4. East Bay, corner of Cumberland St. Fig. 72 H 5. Calhoun St., near and east of Meeting St. Fig. 73 H 6. Water St., looking east. Fig. 74 H 7. Warehouse on Kerr's Wharf. Fig. 75 H 8. Corner of Atlantic Wharf and Exchange St. Fig. 76 H 9. Sailors Home, a charity of the Charleston Port Society. Fig. 77 H 10. Market St. looking east from Meeting St. Fig. 78 H 11. Hayne St., south side, looking west. Fig. 87. View of St. Michael's Church. Fig. 88. St. Philip Episcopal Church. Fig. 91A. So. Carolina R.R. wreck. Cook's Earthquake Views of Charleston and Vicinity Cook sold a collection of photos of earthquake damage. On the rear of each photo was a tabulation of scenes. This image is a scan of the back of two of these photos. Even by today's standards, this is an extensive collection of earthquake photographs. Studies related to the Charleston, South Carolina, earthquake of 1886; tectonics and seismicity. U. S. Geological Survey Professional Paper 1313, 1983. Studies related to the Charleston, South Carolina, earthquake of 1886; Neogene and Quaternary lithostratigraphy and biostratigraphy. U. S. Geological Survey Professional Paper 1367, 1990. Earthquakes in South Carolina 1698-1975, T. R. Visvanathan, Bulletin 40, South Carolina Geological Survey, 1980, 61 pp. First-hand Observations of the Charleston Earthquake of August 31, 1886, and Other Earthquake Materials: Reports of W J McGee, Earle Sloan, Gabriel E. Manigault, Simon Newcomb, and Others, K. E. Peters and R. B. Herrmann, eds., Bulletin 41, South Carolina Geological Survey, 1986, 116pp. Charleston Come Hell or high Water, R. N. S. Whitelaw and A. F. Levkoff, published by A. F. Levkoff and P. F. Whitelaw, Charleston, South Carolina, 146pp. The Charleston earthquake of August 31, 1886, U. S. Geological Survey, Ninth Ann. Rept. 1887-88, pp 203-528.